July | 2007 | Don't Worry. 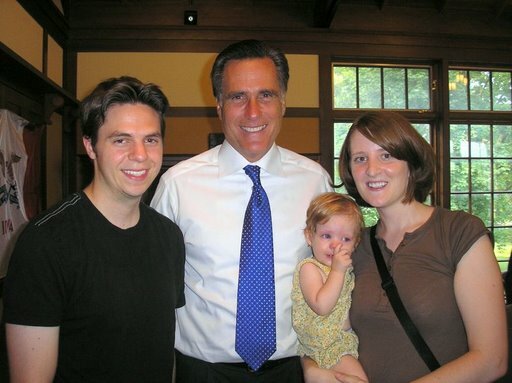 The most exciting thing that happened to us this week was that we were able to meet Governor Mitt Romney. He held a question and answer session in a little town about 20 miles away from us. We really liked what he had to say, and we were impressed with his character. We also got free ice cream (yum) which is always a good thing, and they had a carousel ride for the little ones. Megan DID NOT like the carousel at all. She screamed her little heart out. And for good reason…the music was very LOUD and we were spinning around at like 75 mph. She had her arms wrapped around me in a kung-fu grip until the very end. Meg’s new thing this week is “Head, Shoulders, Knees, and Toes.” She’ll touch her own head, and my “eyes, ears, mouth and nose.” While she was in the bath the other day, I said “Megan, where’s your head?” She reached up and touched her head and I clapped for her and she started laughing so hard. We did it again and again about 20 times and she thought it was so funny every time. Sometimes I would say “where’s mommy’s head?” and she would touch her own head and I would say “noooooo….” and she would laugh even harder. She sure thinks she’s funny. She also did a somersault this week – ALL ON HER OWN! She often puts her head down on the ground and sticks her backside in the air, but this time she full on put her head down and flipped herself over. We were in shock. She hasn’t done it again since, but it was still pretty impressive! It seems as though our little 13 month old has grown up a lot this past week. She threw her first tantrum on Friday (more like all day on Friday). 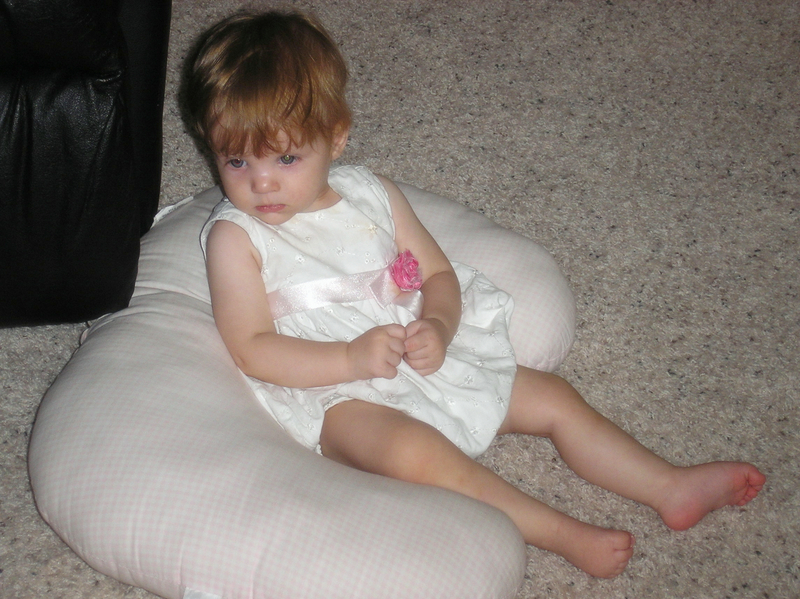 She cried and threw herself on the ground every time she didn’t get what she wanted. We wanted to show her right away that you don’t get what you want by crying and screaming – daddy did the best job being tough. It seemed to work because Saturday and Sunday she has been excellent. She also has started hugging and kissing her dolls and stuffed animals. And she is walking more than ever. It seems like she has finally realized that she can do it. She’s not 100% there yet…but close. Things continue to go well with both of Adam’s jobs. Working the graveyard shift sure is hard on both of us though. Adam gets pretty tired during the day since he can’t make up the missed sleep in one stretch due to tutoring. The hard thing for me is having him home but not being able to be with him because he is sleeping. Fortunately, we only have about 2 more weeks of this. We also have less than three weeks until our big trip to Arkansas. We are really looking forward to that. Well, there is our week. Thanks for stopping by! Congratulations Matt and Mary and welcome to the world Isabelle Ruth!! We are so excited about the addition to our family. I just love that Megan has so many cousins. Within a year of Megan’s birth, each one of our siblings who is married has a had a baby. I am counting Marshall and Isabelle even though they are a few weeks outside of the one year mark – but Marshall is really only 12 months and one week younger than Megan, and Isabelle is only 12 months and 4 weeks younger. Then she has Allison and Michelle who are 10 months older, Tanner who is 7 months older, Owen who is 2 months older, Kimber who is not quite a month younger, Noah who is 7 months younger, and Jamison who is about 11 months younger. That’s 9 cousins within a year. Megan has 21 cousins already. I have only 14 cousins total and Adam has 17. So again, I LOVE that Megan has so many cousins. Megan continues to learn new things every day. Lately she loves to play the piano. As soon as one of us sits down to play she rushes over and fusses until we pull her up on our lap. I think it’s great that she loves the piano so much, so I can hardly complain about her inhibiting my practice time. She also loves to go outside. We live right on some farmland, so yesterday we took her out for some pictures in the fields. Check out our web album for some fun pictures of her near a bale of hay. She’s so small – the bale of hay dwarfs her. She continues to be very well behaved at church. She understands that we will not let her get down and crawl around during sacrament, so she doesn’t even try. She also understands that she is only allowed to play on the floor near mom and dad during Sunday school and R.S/Priesthood so she is very good about that. About 2 months ago Megan took several solid steps. We thought she was just weeks or days away from walking. Well, she is just now starting to walk again. She just takes a few steps at a time and then sits down and claps for herself. We aren’t pushing her or anything, but I think once she realizes she can do it – she will just take off. A few weeks ago she started doing the hand motions for “Isty, Bitsy, Spider” . I never sang her that song – so I give all the credit to Adam. Of course, I sing it to her now because I love to watch her do the motions. So cute! Megan has always been fascinated with ceiling fans. Ever since day one. We ask her – “where’s the fan”, and she looks up and points. Well, this week, not only does she point at it, but she follows the fan’s circular motion with her little hand. It is more like she is waving it back and forth, but she definitely gets the point! Adam’s work is going well. He gets tired easy, but he only has a few more weeks of the late night shift. Tutoring is usually a hit or miss – either he knows how to help the kids really well, or he doesn’t know at all. Some of the stuff he hasn’t done for almost five years so you can hardly blame him. Mostly he does really well though. My big thing this week was, of course, Harry Potter and the Deathly Hallows. I was so excited when I went to pick it up. I even got a little teary eyed on the drive home from Borders. I thought the book started pretty slow, but I loved it in the end. Thanks mom for making me read Harry Potter and the Sorcerer’s Stone when I was 15. I love it! Adam has also gotten me into Halo 2 on XBOX. I sometimes even play by myself when he is not home. The people I play against are WAY better than me, but I am getting better. Watch out “SupaflyTy”. I am not sure what else to report, but surely this is long enough. I posted pictures from this week on our Web Album in the folder entitled “Our Week”. I will just clear out the same folder each week and put in the new pictures. Again congrats to M&M and we can’t wait to see your little “Peanut”! Sundays seem like a really good day to give a life update for those who actually read our blog. Frequently, after something fun has happened around here, I want to hop right on and tell the world, but I doubt anyone is just holding their breath waiting to hear what’s going on with the Johansons. So here is our week in review. They have a great library here in Ames. 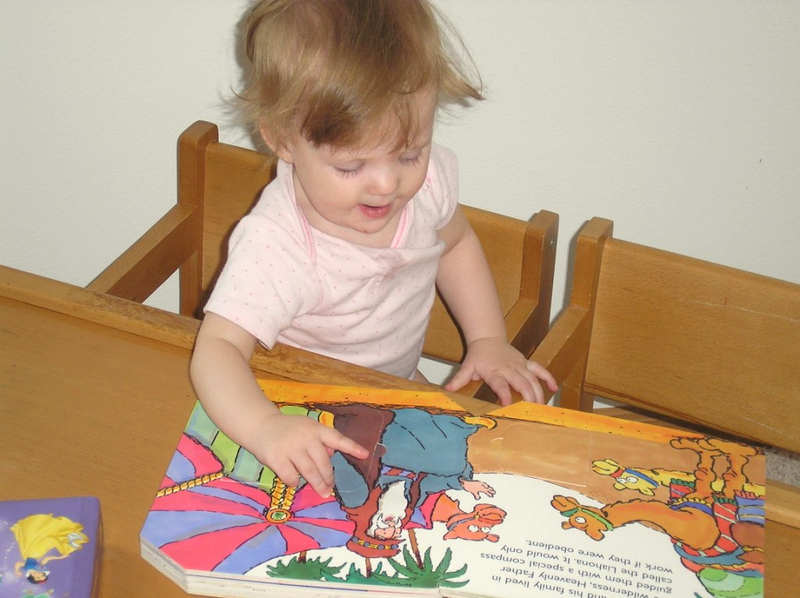 One thing that I knew I would miss from Provo was the “Book Babies” group that I would take Megan to. They have a group just like it here for Megan. In fact, they have even more incentives to get your children reading. Megan absolutely loves going to the library. 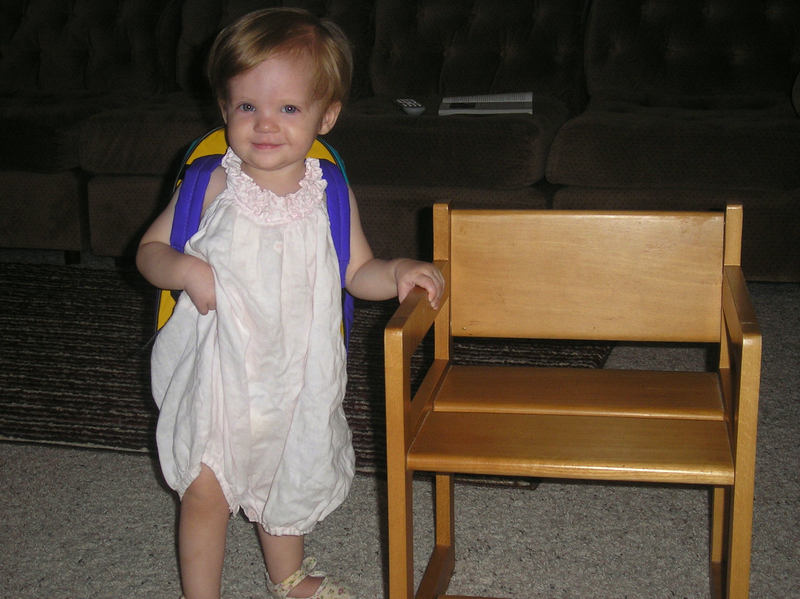 She gets so excited when we get out her little backpack because she knows it’s library time. She even wears the backpack all around the library. I let her pick some books and we put them in her backpack (usually I end up taking a few out and put them in my bag or else she would topple over). I really want her to enjoy reading. I love to read; Adam hates it. 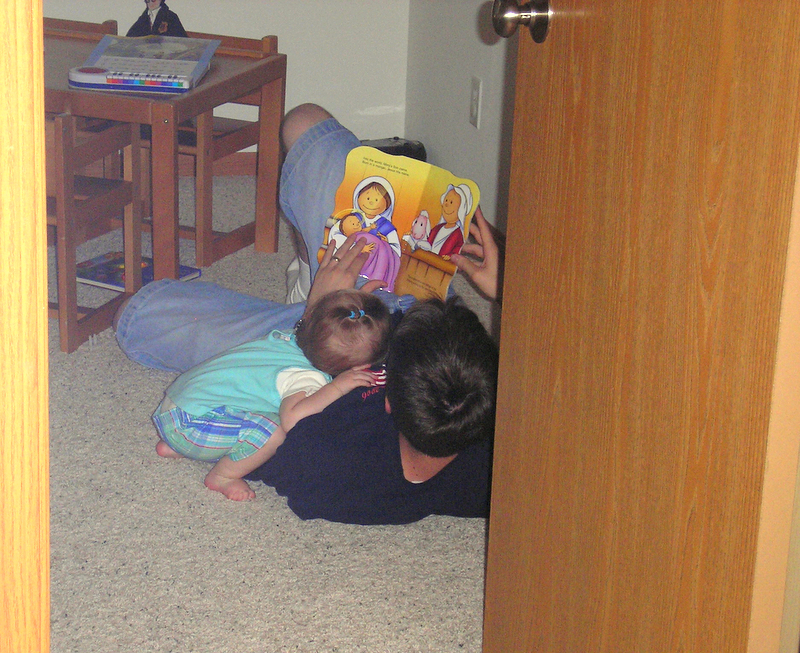 He reads to her every night though so I think he sees the value in reading appreciation. I have mentioned before that there are TONS of parks here in Ames. Adam and I take Megan to the park AT LEAST once a week – usually more. So yesterday we went to a park that we had not been to before. It had the traditional play station as well as some swings. At the very back of the park there was a trail (all the parks have trails that you can take through the woods and they open up either to a main road or another trail). We decided to follow the trail to see where it would lead. We were surprised to find that it went through the backyards of people’s houses. We were so jealous. There was even a stream and a bridge…we decided if we ever buy a house in Ames, that is where we will live. It was beautiful and just a stone throw away from the park. We have used sign language with Megan since she was about 6 months old. She is familiar with a lot of signs – she used to do them a lot, but she hasn’t really done any signs in a while (we still do them and she still responds – more through action now than actual signing). Anyway, this week she has been doing the sign for “milk” A LOT. She’ll be playing with daddy and just start making the sign. She’ll do it over and over again and then start whining. We are sure it has to do with the weaning. We are a little torn because we want to encourage her to communicate and you’re supposed to respond right away when they do a sign. She’s a little tricker this one. Her new word this week is “go”. She doesn’t actually say it, she yells it! She’ll just be sitting there and then she’ll yell out “go!” The cutest is still “uh-oh”. She loves to knock things over and drop things just so she can say “uh-oh”. Then she gets this huge grin on her face and does it all over again. She’s also a little monkey. She recently learned that she can get on and off the couch by herself, so she does it all the time. The other day she even tried to climb up the wall. 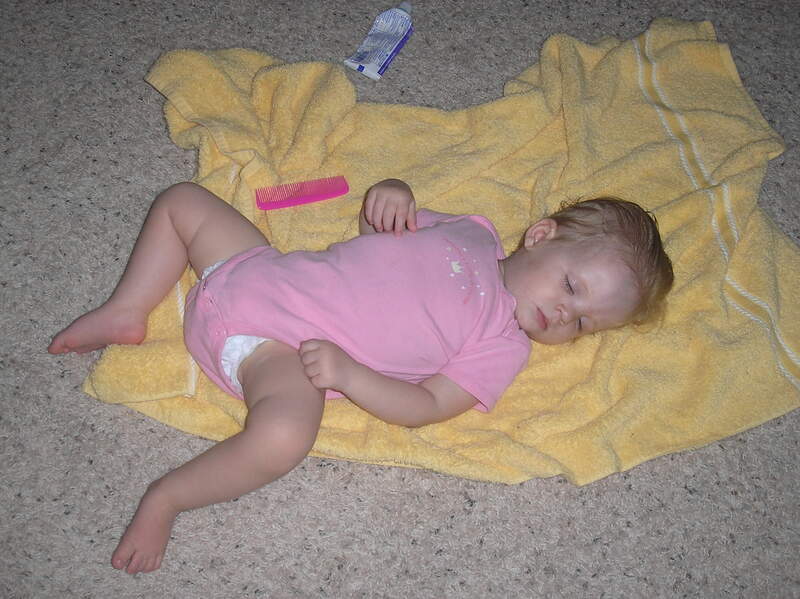 When we lived in Utah it was pretty hard to get Megan to fall asleep on her own. We shared a room, and we lived in a duplex so the neighbors would hear her if she cried. So instead of battling it out for a few days, I spoiled her and either rocked her or nursed her to sleep. I still don’t mind rocking her, but lately we’ve been trying to get her to sleep on her own (without crying it out – let’s face it – I’m too soft). It has been going pretty well. Well, after her nighttime bath, Adam always brushes her hair, puts lotion on her, puts Destin on her, diapers her and dresses her. Last night he was dressing her in front of the TV while we watched the game show channel (one of Megan’s favorites). Not two minutes after he put her onesie on, he looked down to see that she was totally asleep. Who knew that Family Feud was mother’s best kept secret? There is, actually, more to our life than just Megan (a shocker – I know). Adam is tutoring at ISU for Physics students. At first he was a little rusty, but he is getting the hang of it. ISU is a really pretty campus – it is a lot greener than BYU and the buildings are really fun. Some are really old though and they are working on renovations. Aside from tutoring, Adam and I like to watch movies. We do Netflix and the library has tons of DVDs. This week we watched “The Island”. I liked it, and Adam really liked it. We also watched “Beyond the Sea”. It was okay – the story line was a little weird though. This is probably the longest Blog the world has ever seen. That’s what our week was like though. I hope someone took the time to read about us! We had a fun filled fourth! It started bright and early with a ward breakfast. We were on the committee so we got to help cook pancakes for over 300 people. Megan didn’t much like being woken up early so she was exhausted by the time we got home. However, she did enjoy watching all the other children run around. She took a nice long Fourth of July nap and then it was time for more fun! She went swimming and enjoyed the sun and then helped Mommy make a yummy red, white, and blue jello dessert (it turned out sooooo delicious). We were going to go to a parade but apparently making dessert makes Megan tired so she conked out for a second nap (I can’t remember the last time she took two naps!). After Megan’s nap we enjoyed some traditional BBQed hot dogs (does the George Foreman grill count as BBQ? HA!). 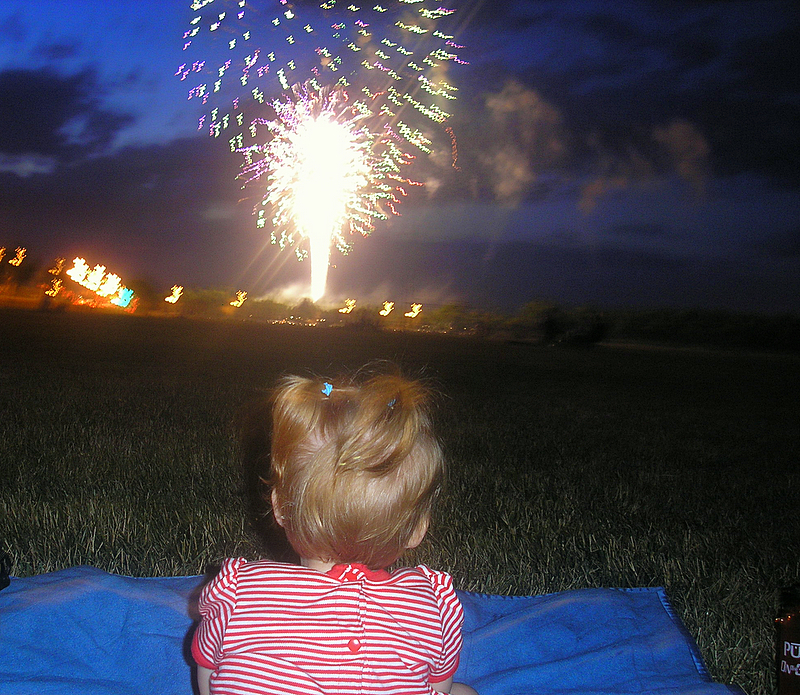 Then we took Megan to see the fireworks with a large group of other LDS families. When I say large group, I mean all the members in and around Ames. She had a blast. She loved watching Adam and I play catch with the football and she laughed as all the children ran around her with sparklers. We were excited to see how she would react to the fireworks. She really enjoyed them. It was a pretty long show, and she got a little antsy, but for the most part she watched them. We went home and we had root beer floats and then she went to bed. We all had a great holiday! As always, check out our web albums at http://picasaweb.google.com/aejohanson for more pictures. 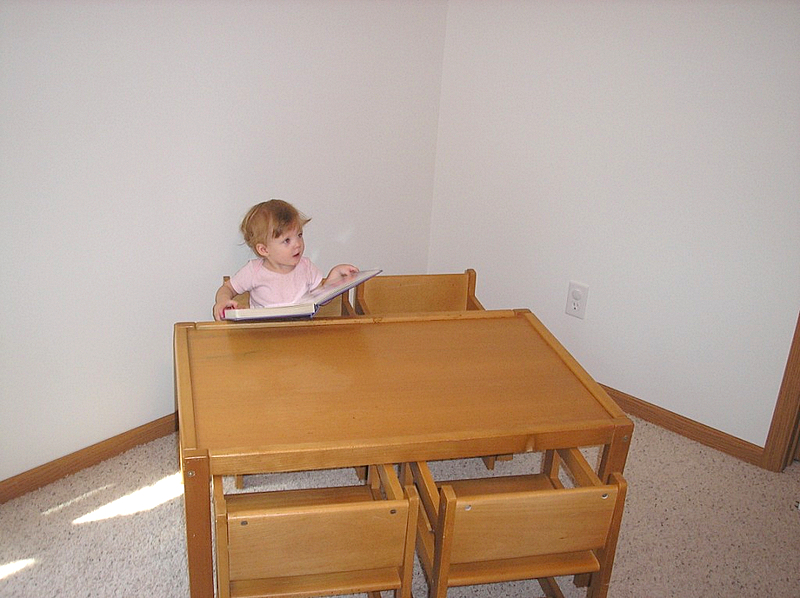 For the past little while we have been thinking of getting Megan a small table for her room. 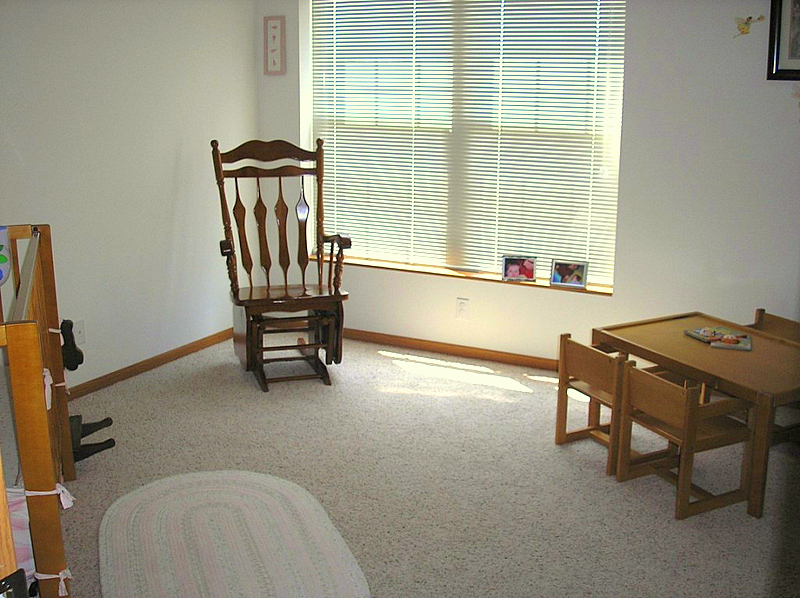 We’ve looked around a little, but we couldn’t find anything in the right price range that also matched her room. This morning we found the perfect table – at a smoking hot deal! Megan absolutely loves her new table – and we love making her happy. Well, actually it was mostly daddy who made her happy because he gave the okay to buy it, and that made me happy too…Adam is good at that! Anyway, enjoy some pictures of Megan’s new table. Also, don’t forget our web albums. There are even more pictures posted there. So Adam and I got called into the bishop’s office today. We thought we were both getting another calling (we are both already on the activities committee and they told us we would probably have another calling). Well, they just had a calling for me…make that two callings. I am now on the activities committee, as well as the Relief Society pianist, as well as a ward librarian. Really our ward is not that small, I’m just really special. I look forward to all my callings and getting to know lots of people. I like to attach pictures with each blog. Here is a lovely blue one of us after church.